Opened in 1989, the museum is housed in the Church of Santa Maria del Gesù, in the town centre. It was founded to gather together in a suitable place the large artistic heritage of the old churches in the San Casciano district, including those of San Giovanni in Argiano, San Martino in Sugana, and San Pietro di sopra. The church was founded in the second half of the 15th century as a hospice by the Franciscan Observants, and has undergone various vicissitudes over the centuries. Almost completely destroyed during the Second World War, it has since been rebuilt. Its being a museum does not prevent it from being used for the liturgy. As is traditional, the large hall of the single nave is lined with paintings. The most valuable works of art and objects are gathered In the small attached oratory and on the upper floor and include silverworks and liturgical vestments and hangings, many of which are extraordinarily important in the history of Italian art. In the painting section, which distinguishes this museum for the quality and importance of the works present, the altar frontal depicting Saint Michael the Archangel and the stories from his legend must be pointed out first of all. 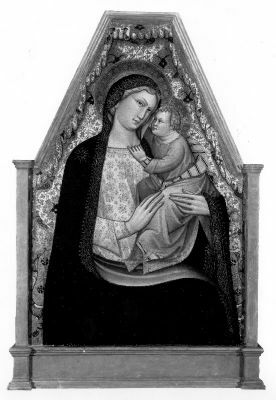 It was carried out by Coppo di Marcovaldo before 1260 for the Church of Vico l’Abate and is a powerful example of Florentine painting before Cimabue. 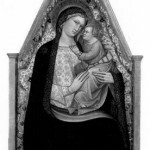 There is also a remarkable group of 14th-century panels that document the developments and trends of the Tuscan school, including works by Lippo di Benivieni, Jacopo del Casentino, Francesco Fiorentino, and Cenni di Francesco. 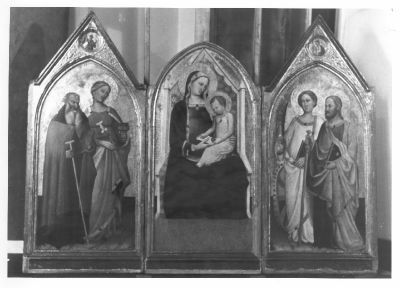 In addition, there is the large triptych dated 1398 by the Master of Sant’Jacopo a Mucciana that was found in the church of the same name. Standing out above all of them is the first known work by the Sienese artist Ambrogio Lorenzetti, the famous Madonna and Child from the Church of Vico l’Abate, dated 1319. 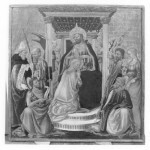 The 15th century is well represented by Neri di Bicci, with his Coronation of the Virgin (dated 1476 and 1481), commissioned by the Giandonati family, patrons of the Church of San Giovanni in Sugana. It is a late work of the artist who was a prolific popularizer of great Renaissance painting even in the Florentine countryside. 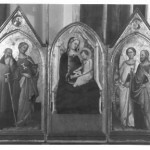 Among the museum’s many later paintings, let us mention the altarpiece with the Three Saints by the Master of Tavarnelle (formerly attributed to Raffaellino del Garbo) and the Madonna Enthroned with Child and Saints that critics have often attributed to Granacci. There are also noteworthy examples of sculpture, including a baptismal font shaft by the Romanesque Master of Cabestany (12th century), a Madonna and Child by Gino Micheli (1341), a Della Robbia terracotta depicting the head of a young man (early 16th century), and the monumental Angel candle-holders in gilded wood from the 17th century. 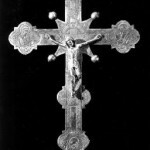 As regards silverworks, there is a beautiful group of processional crosses from the 14th and 15th centuries, a brass incense boat and thurible displaying typical 15th-century characteristics, as well as chalices, monstrances, pyxes, and thuribles that are mostly high quality traditional Tuscan products, from the 14th to the 19th centuries. Among the liturgical vestments and hangings to be pointed out are the valuable curtains that probably protected the Madonna of the Pieve Vecchia (stolen a long time ago) embroidered with extremely refined designs in addition to a three-piece set in lampas with large red flowers on a yellow background. Il Museo d’arte sacra di San Casciano Val di Pesa. Proto Pisani R.C. (a cura di), Firenze, Editore: Becocci/Scala, 1992. Size: 41 cm. x 31 cm. Following the typical typology inspired by Andrea Pisano’s model, the front displays Christ in relief against a background decorated with stylized geometrical elements. 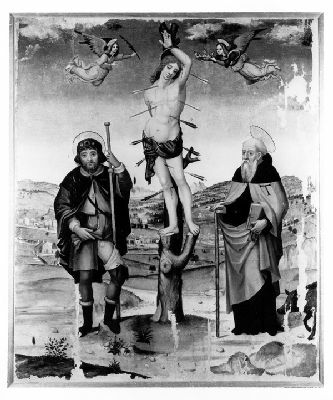 The small panels depict a pelican above, the Virgin on the right, and Saint John. We do not know the original use of this sculpture which was transformed into a holy water stand. It has been suggested that it may have been part of a baptismal font because of the layout of the scenes representing the Nativity cycle. This work is characterized by the classicism typical of Romanesque sculptures from the western part of France or the northern part of Spain. Size: 25 cm. 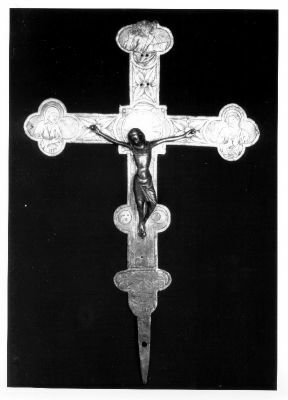 x 7.2 cm. It is paired with an incense boat that is stamped with the same date and identical provenance: “SOC. B.M.V. ANNTAE S. MARTINI F. 1775?. The pod shaped decoration in the lower part is Also the same as that on the incense boat, whereas there are elegant fretwork, volutes, and shells in the upper part. Size: 145.5 cm. x 145.5 cm. 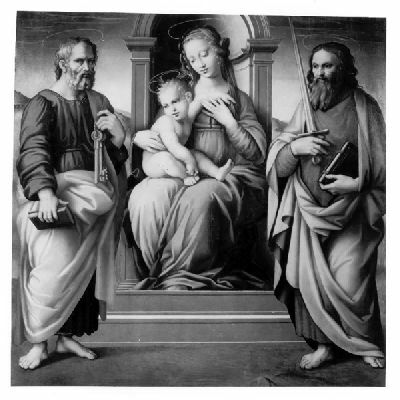 This altarpiece is supposed to be a popular reproduction of a famous lost prototype because of its strong similarities to Raphael’s composition and Leonardo’s chiaroscuro. Size: 43 cm. x 28 cm. 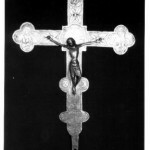 Rare example of a silver-plated copper cross, since copper was usually gilded. 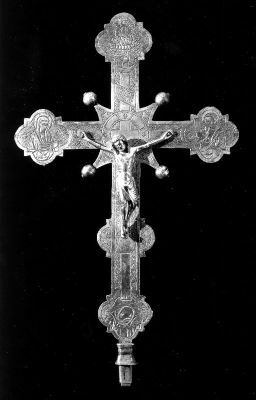 In the centre, against a decoration with stylized flowers, is the Crucified in relief. On the back, the Agnus Dei is in the central clypeus and the symbols of the four evangelists are on the panels. Size: 95 cm. x 63 cm. Cenni di Francesco was very active in Tuscany during the last quarter of the 14th century and the first decade of the following century. He was among the most fruitful and pleasant popularizers of Florentine late Gothic painting. Size: 117 cm. x 148 cm. 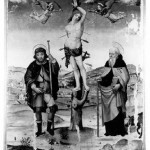 Because of the presence of the three saints who protect against plague, the painting could be an ex-voto offering. In the background is the village of Cerbaia, seen from the parish church, and the ancient Hospice of Santa Caterina with frescoes by Bicci di Lorenzo. Decorated with delicate acanthus leaves, this reliquary shaft stands on a triangular base resting on volute feet. Attached on the front are the lance and stick with a sponge. 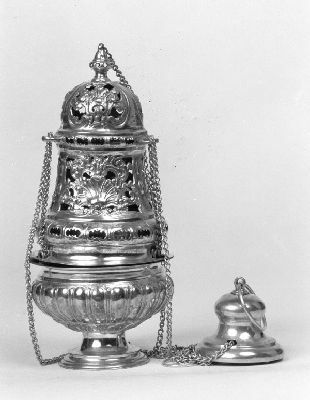 The reliquary container is the cross with a volute and shell decoration along the perimeter. Size: 184 cm. x 183 cm. The painting was commissioned by the Giandonati family, patrons of the church, and specifically by Giraldo dei Giandonati, appointed prior of the Seigniory in Florence on May 1st, 1477. Size: 121 cm. x 161 cm. The painting was chosen by Offner to give a conventional name to a minor artist with many works. It illustrates quite well the cultural attitude of the small Florentine workshops that were used to meet the everyday demands of the art market. by car: from Siena: Si-Fi highway, exit at San Casciano Val di Pesa. Via Motorway: Exit A 1 at Certosa. Take Fi-Si highway and exit at San Casciano Val di Pesa.